Two weeks ago, our entire student body participated in our Fuerza Learning Experience (FLEx) Week. 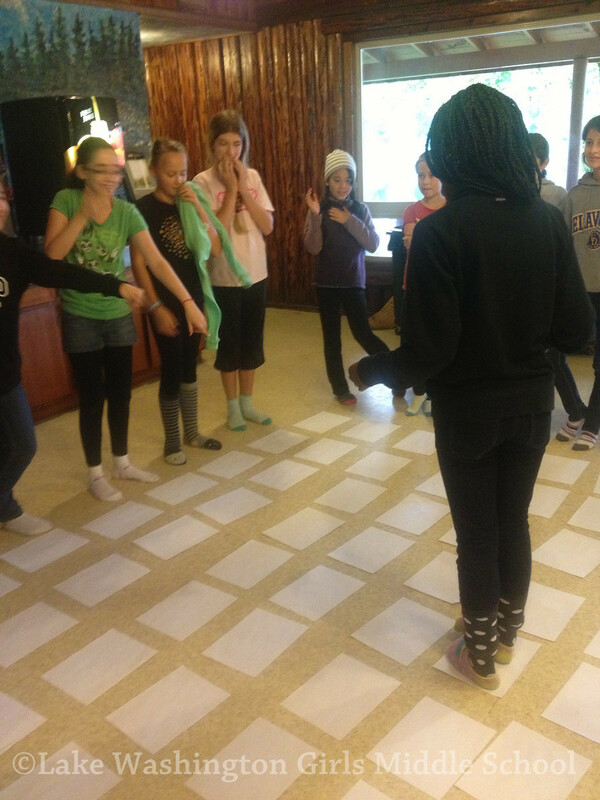 Each class headed off-campus – in very different directions – to have curricular and bonding experiences. Our newest class, the Class of 2016, spent the week in Olympia. 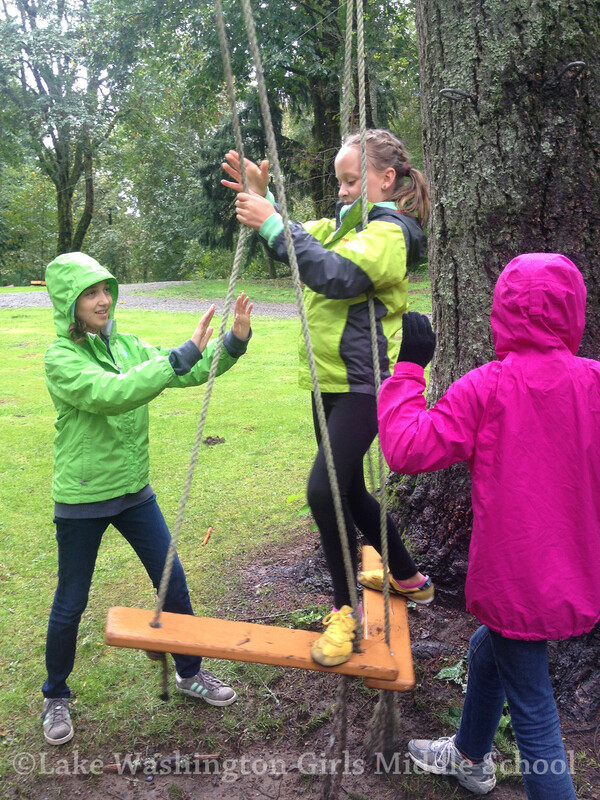 The primary goal of the sixth grade trip was to build community. Every activity, every meal, every moment was devoted to fulfilling that mission. Over the course of two days, the girls climbed walls, walked runways, bestowed compliments, hiked in the darkness, embellished notebooks, danced in strobe lighting, speed-dated, and celebrated each other. When FLEx Week began and we got to Camp Solomon Schechter in Olympia, we were friends, but in that awkward ‘I know you, but not really’ way. All of that was about to end. On the first night at camp, we had ‘dinner dates’ to get to know one other girl that we hadn’t yet spent much time with. The second day was the day that we really got close. 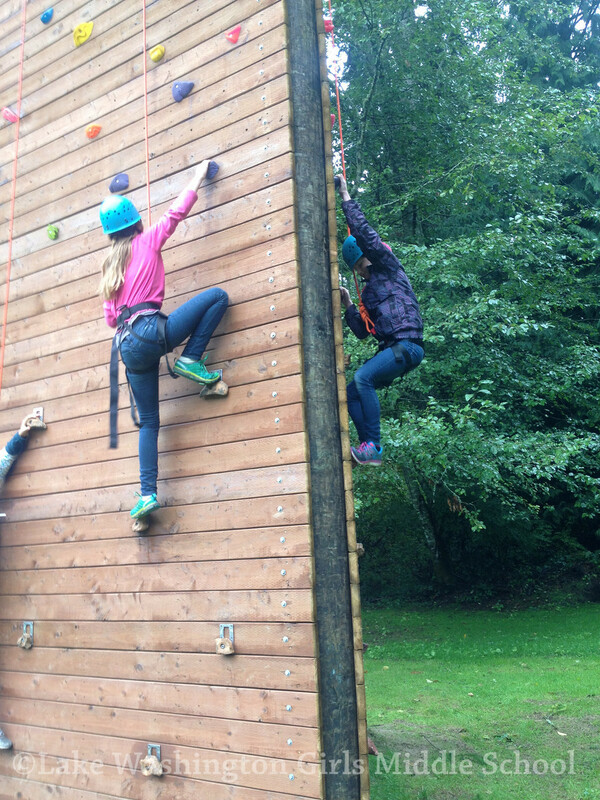 In the morning, we completed challenge courses and tackled the climbing wall. We learned more about each others’ strengths and challenges from being on the belay team for the climbing wall. 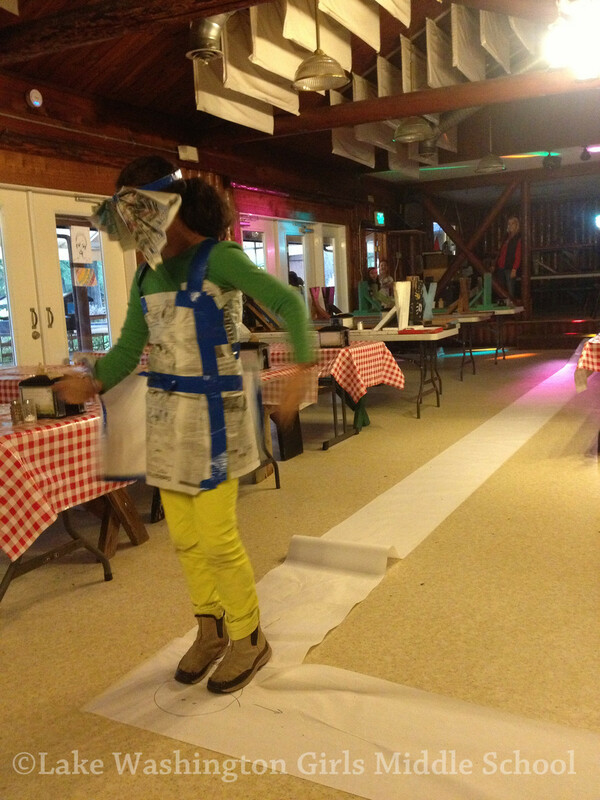 Later that day, we got really close with our cabin mates through putting on a project runway fashion show! 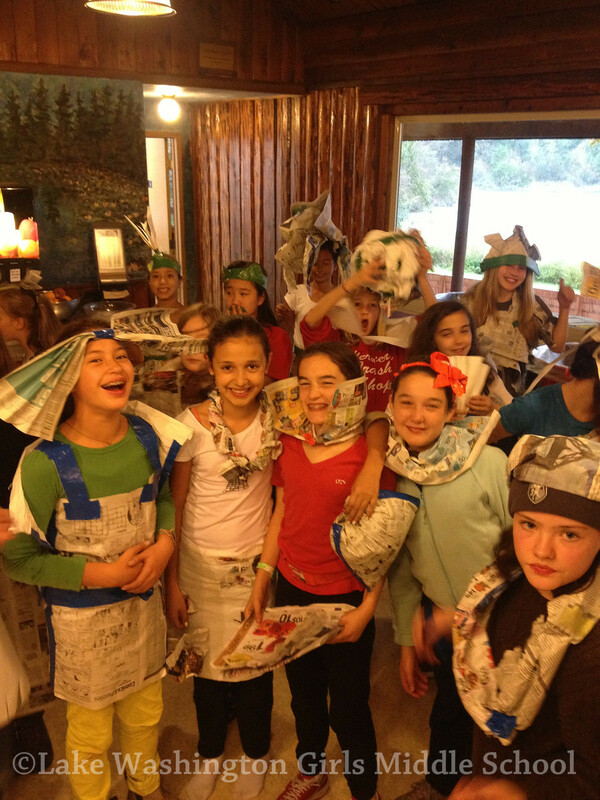 Teams could only use the following materials: newspaper, crepe paper, duct tape, and scissors. It was tricky, but when the fashion show was put on, it was epic. Then there was an announcement about a talent show. The teachers drew sticks to put us in performance groups, and it was super fun! My group did a remix of Happy Birthday, another group did an improvised skit, and all the groups were fantastic, and really funny! 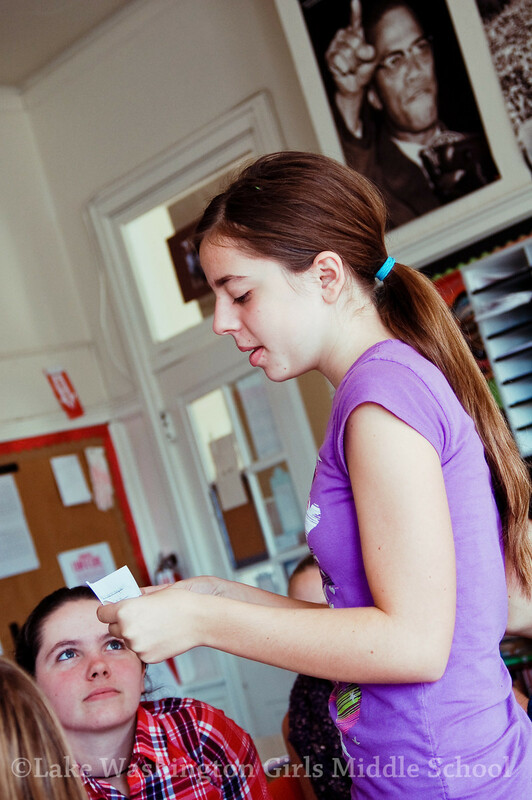 After that, we got into a compliment circle: Earlier that day, we had received a name of another person in our 6th grade class, and were asked to think up a really meaningful, heartfelt compliment for them. Around the compliment circle, we presented our compliment to our ‘secret complimentee’ in front of everybody. It was really sweet, and our compliments made Ms. Caitlin cry! We spent our days bonding through all types of activities, and on our own. I feel really close to my fellow 6th graders now, and I now can’t imagine having done anywhere else for middle school. It’s almost as if I have 33 new sisters that will always look out for me! I’m so glad we went on our trip! See all of Ms. Chelsea's photos from FLEx Week here. Most of all, I feel like I belong…When I look around at these people, I see amazing things. It makes me smile. But most of all, they see the beauty in me. I am no longer the girl who eats alone and has no friends. I am happy. I feel like people got to know me as an outgoing, silly girl, but also the side of me that is kind of stressed out. But now I think that is good. I want them to know the good things about me and some of the not-so-good things. Over the two days that I lived in camp, I have realized that I don’t just have L-Dub friends, but L-Dub family. I feel like I am always smiling or laughing and when I’m not, someone will come up to me and hug me. I am surrounded with people that care about me. The compliments that you got made it so you could not stop smiling, and they filled you with joy. You knew right after that, that you could trust anybody in that room to be your friend because you saw how everyone’s compliments were from the heart. I had so much fun, from waking up to music in the morning to falling asleep to Winn Dixie at night. Now, on the last day of camp, you have a feeling that you have never felt before. You are not embarrassed. The next time you will try to make new friends, you will just be yourself and not afraid that if you say something, someone is going to think that you are weird because they won’t. You are wild, crazy, and funny, and there is nothing to be embarrassed about that. You will treasure the moment at camp when you realized that for your whole life. I feel like I’ve known everyone in my class my whole life. It’s a great feeling! This was really fun, and I’m really excited to be with these girls for the next three years. Now that I’ve gone on this trip, I don’t think I’ll ever forget how easy it was to let go of the shyness that was holding me back from all of the crazy sixth graders I’ll be spending a lot of time with during school. Every single compliment had so much meaning, and they were all so lovely and thoughtful, they made me want to cry too. I’m amazed at how much this class feels like a community. When giving compliments, you felt as if you were on top of the world. Making people feel great about themselves is an amazing quality to have. Remember you are surrounded by friends and people who care about you. During this trip, I feel like everyone has moved at least a foot closer. 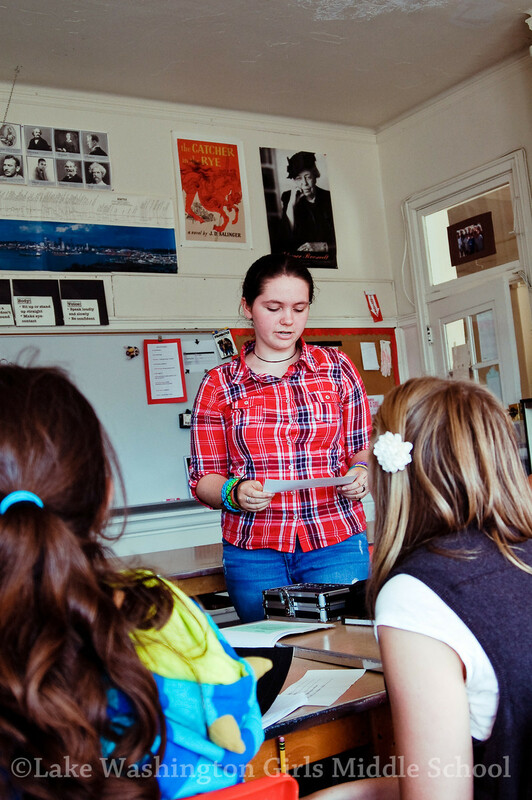 I feel like we have known each other forever…I feel like this class does really well with teamwork…Everyone in this class is positive! I feel so comfortable around all my classmates. I don’t feel like any of them aren’t my friends. The awesome thing about being in this class is that I feel like I have 33 sisters who will stand by me even when I’m wrong. That’s an awesome feeling to have. Now I feel that I can talk to anybody or dance with anybody…and now I really think in 8th grade I could become strong in mind, body, and voice.